I was just recently discussing with my sis that every now and again, we must take the time to enjoy the absolutely ridiculous things in life. Exhibit A, for example. 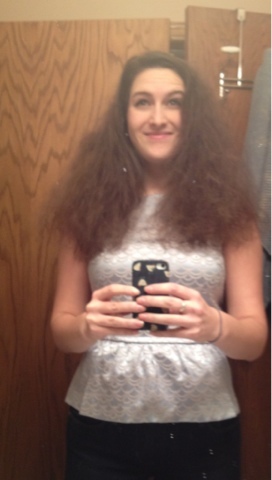 I was simply taking my hair out of a braid and in a flash it was an Afro. Just a simple, white girl fro. So clearly the first thing you do is snap documentation to prove to your homies that yes, in fact, you do have a little ghetto running through your preppy veins. So here's to the silly, whimsical, belly-aching times of life! Enjoy them every day. Because that's what it's all about, eh?